Archway + OWH = Special mission! 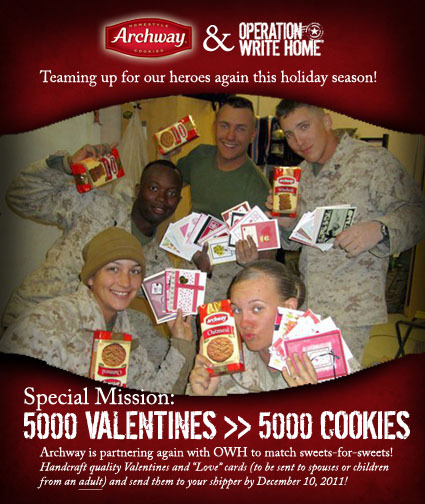 After our inaugural year of partnering to match sweets for sweets to send to our heroes —we’re back again! This year we’ve upped our goal from 4,000 to 5000…lots and lots of love cards need to be sent homeward to carry our heroes’ hearts to their families! Deadline is Dec. 10th (cards can still come in til Dec 31, but will count for the match only til the 10th) and must be received on or before that day. And just to inspire us on getting more of those love cards sent in – upload a photo of your cards and drop a link below for us – it can be your favorite love card, your packaged up box, a plate of Archway cookies on your craft table (YUM! ), a photo of your trip to the post office. Whatever you’d like to share! For those awaiting it…our vlog for this weekend! A sale and a prize for YOU too! I Brake for Stamps is offering a coupon code for OWHers! We’ve added it to the Donate/Shop page, so you can pick up the code there. 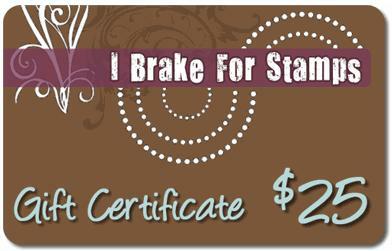 She’s also offering a prize – a $25 gift certificate! We’ll choose a winner using random.org at the end of the contest from all qualified cards sent in (meeting the above requirements). Be sure your cards are in on time! Woohoo! We made it! And down to the finish line! Way to go crafters!